Some toothaches go away on their own, but others indicate a more serious problem. If you experience a severe toothache that lasts longer than 1 or 2 days; fever, earache, or pain when you open your mouth; difficulty breathing or swallowing; or foul-tasting drainage from the infected tooth, visit your dentist immediately. You’ll even find some toothache remedies that you can use anywhere, even in the car! Clove oil contains high levels of eugenol, an anesthetic and antiseptic compound. It’s even used in modern dentistry to relieve gum pain and kill germs during extractions, fillings, and root canals. One study even found that it’s as effective in numbing pain as the synthetic local anesthetic benzocaine. To use, mix 1 tsp of coconut oil with 2-3 drops of clove oil. Apply directly to the area of pain using a cotton ball and leave on for a few minutes. Once the area is numb, remove the ball and rinse your mouth to avoid swallowing the clove oil. Alternatively, chew a few cloves using the teeth closest to the site of your pain. Once your gums and tongue feel tingly, discard the cloves and rinse out your mouth. Repeat as needed. This antibiotic paste helps control bleeding, reduce swelling, relieve pain, and fight infection (4,5). To make, mix equal parts of ginger and cayenne with a little bit of water to make a paste. 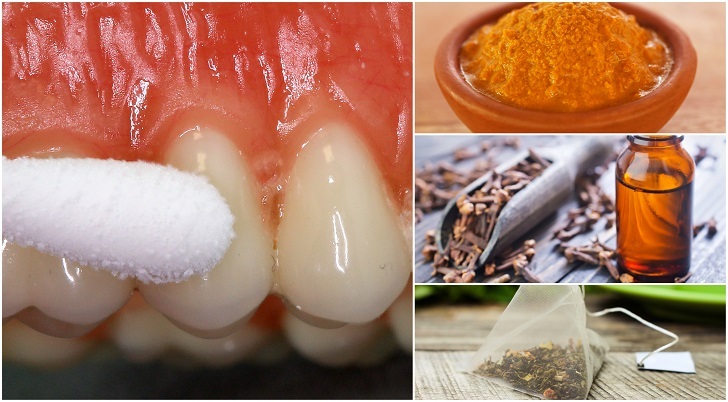 Saturate a cotton ball in the formula and apply to your tooth, away from your gums and tongue. Leave it on as long as possible and avoid swallowing if possible. This simple solution uses a teaspoon of salt dissolved in a cup of boiling water to fight infection and relieve throat pain. It’s also a great solution to flush away debris and ease swelling. Make sure to let the water to cool slightly and swish around for at least 30 seconds before spitting it out. Repeat as needed. Peppermint oil is an effective intracanal antiseptic solution against oral pathogens, according to a 2013 study. The best way to make the remedy work for you is by drinking peppermint tea containing at least 1 teaspoon of peppermint leaves steeped for a minimum of 20 minutes. This will also relieve bad breath and a bad headache, a typical side-effect tooth pain. Alternatively, steep up some strong black tea, drink up, and place a warm wet tea bag against affected tooth. “Myrrh’s astringent properties help with inflammation, and a rinse can offer the added benefit of reducing bacteria,” writes RDH. To make your own myrrh rinse, simmer one teaspoon of powdered myrrh in two cups of water. Let it cool and use five or six times a daily, after eating. Garlic is a true powerhouse when it comes to natural medicine, as it has the ability to fight viruses, bacteria, fungi, and more. Allicin, the main active compound in garlic, doesn’t respond well to heat, so it’s best to use raw garlic as medicine. First, crush a clove of garlic and let it sit for 15 minutes to activate its beneficial compounds. Then, you can either mash it with a bit of salt and apply the paste directly to the affected tooth or chew the clove using the affected tooth. Repeat 2-3 times daily, as needed. Strangest of these toothache remedies is the unassuming vanilla extract. As Arizona Family Dental mentions, vanilla extract works in two ways: it contains alcohol, which is a numbing agent, and the scent of vanilla doubles as a soothing agent to help you fight some of the anxiety associated with a toothache. To use, dab a small amount of vanilla extract on your finger and rub the throbbing tooth and gum area. Apply 2-3 times daily. This paste combines the antibacterial and antiviral properties of both turmeric and coconut oil to fight infection-related pain (10). It also combats irritation, gum redness, bad breath, and tooth stains.